July 19, 2012 — In the heat of July, there’s one spot inside of BlueCat Motors where one can escape to air conditioning: the lobby. That’s where I was sitting, iPad in hand, trying to lower my core temperature back down into the upper 90s. While hot, I certainly wasn’t bothered. 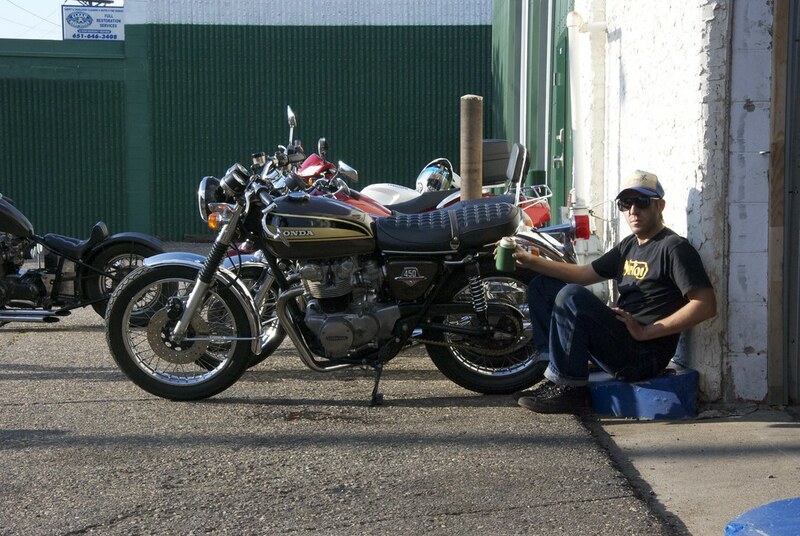 I’d been bombing around all day on my new ’74 Honda CB450 Supersport. Sitting on the lobby couch, I took in mouthfuls of cold water, holding each until the chill left my mouth before swallowing it down. A little radiant floor cooling for my excited brain. I had about an hour to kill before my first big event of the weekend: Third Thursday at BlueCat Motors. 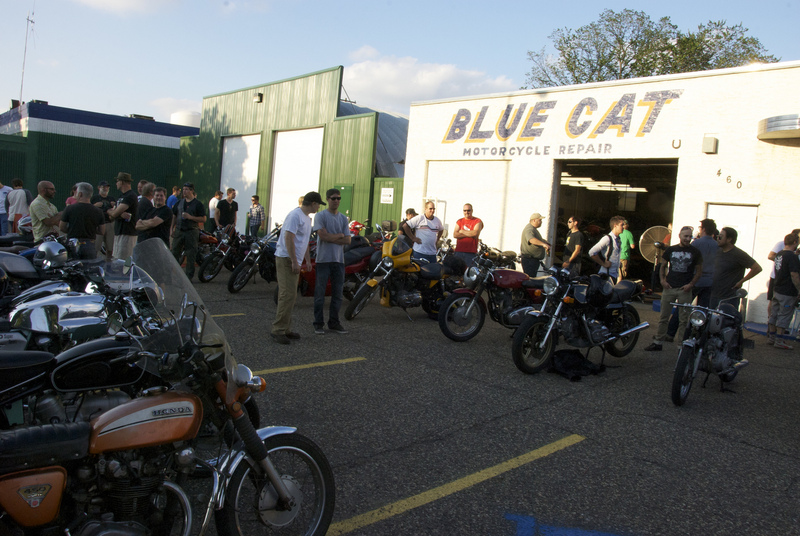 Every month of riding season, BCM opens their doors to the whole two-wheel community. They invite a food truck out and make themselves available to hang out and answer questions about vintage bikes. Thing is, the event really takes on a life of its own. It’s not about BCM; they’re simply the host for it. The people who turn out for it are what make the event so special. Rather than just a single, common kind of motorcycle or scooter, Third Thursday tends to attract a certain kind of riding enthusiast. It’s people who love to ride and love what they ride. It’s mostly older machines, but the sheer variety of machines is amazing. At any given month’s event, you’re likely to see everything from highly modified racing mopeds, to Japanese cafe racers, to museum quality restored airhead BMWs. The occasional modern scooter and bumbling Harley will show up as well. The common thread is a common kind of person — a laid back rider who loves their machine, but appreciates others as well. As people started to arrive that Thursday, it was familiar faces and familiar bikes and BCM felt more like home than ever. Last year, because my own machines were all in various stages of repair, I’d attended most of the season’s Third Thursdays on The Mrs’ ’81 Honda CM400. Not that I really minded, because the CM400 is a blast to ride and is itself a BlueCat bike. It was never quite right though, as it wasn’t my motorcycle. 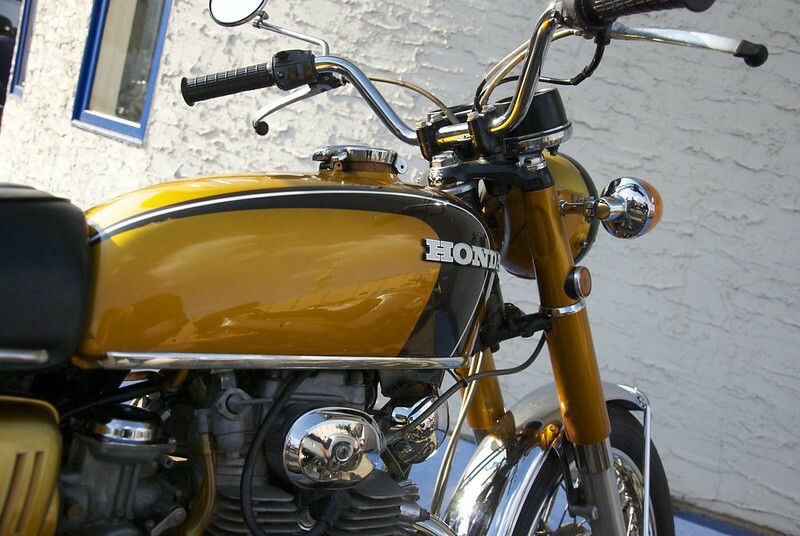 Even attending the final Third Thursday of 2011 on a freshly resurrected ’81 CB750 wasn’t quite what I was after. That wasn’t a bike I meant to keep. That hot Thursday, however, all was made right as my CB450 sat shining in the setting sunlight just outside the main garage door. People would ask me, “What are you riding?” and I could point out my brown beast like the proud papa I was. There were two bikes and riders in particular who I had a lot of fun connecting with. One was an old-timer on an orange Honda CL450, complete with luggage. The other was a guy about my age on a bright gold Honda CB350. The CL450 was as weathered and worn as its owner — a kindly old gentlemen who looked just as likely to sell me a jar of moonshine as shake my hand. He regaled me with tales of cross-country rides and improvised maintenance. His machine looked solid, and it gave me hope that my CB450 (which is basically the same machine) would also enjoy a long, colorful life. 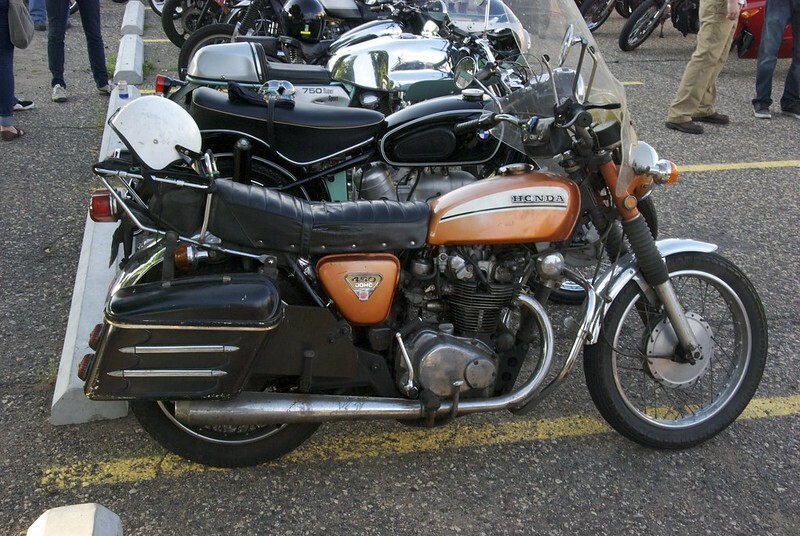 The CB350 was a terrific “rolling patina” machine not too unlike my own CB450. The paint was bright, if imperfect. The engine ran strong and loud through a pair of big Dunstall-style pipes. We talked briefly about the machine, which turned out to belong to his father. I have to admit, I was a little jealous. I’d love to have the old Cushman scooter my dad used to run around on when he was a kid. Not because I’m that into Cushmans, just because of the association. This bike’s rider and I parted ways then for the taco truck, but I’d see him again later on. Each month, I make an update on the BCM blog letting everybody know the event is on, and what to expect in terms of food and other fun stuff. Before coming into town, I had a text message exchange with Ryan, the owner at BlueCat Motors, to make sure the event was still on this month. Taco truck? Check. Fifteen piece brass band? I thought for sure he was kidding. I figured he was just excited for the event. I sure was. Turns out he wasn’t kidding at all. As more and more motorcycles, mopeds and scooters filtered into the BCM parking lot, the occasional person would roll up on a bicycle wearing what looked like Mr. McFeeley’s hat from Mr. Rogers Neighborhood. They kept trickling in one by one. 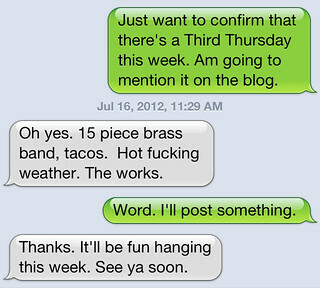 I’d forgotten all about Ryan’s text message and didn’t put two and two together until the instruments started coming out and the band began assembling. Soon they were pumping out the happiest little oom-pah songs you can imagine. What was even more surprising was just what a great fit it was. 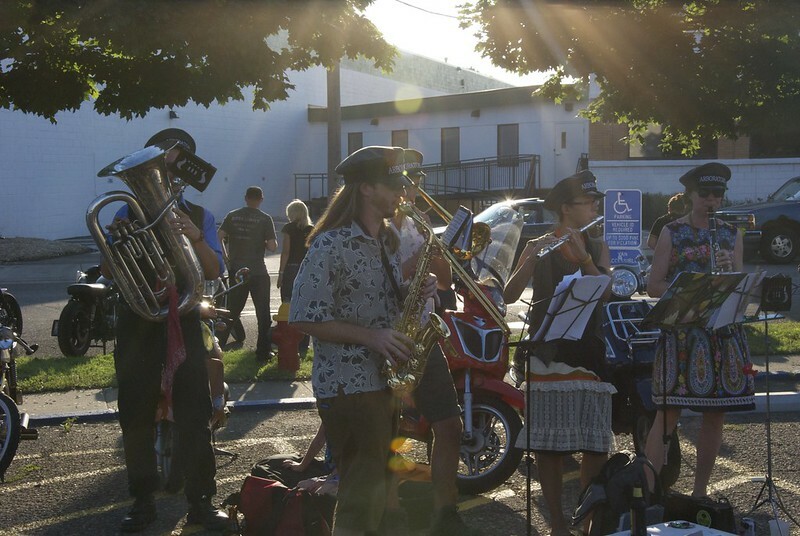 The band was playing these quaint little songs, melancholy and happy all at the same time — not at all the kind of music one would expect at a motorcycle gathering. They played with enthusiasm and without an ounce of irony, and somehow, it just worked. The charm of the whole scene was as infectious as it was uncanny. As the sun sank lower in the sky, I needed to head out. I was staying across town with my dear friends Susan and Sam. I said my goodbyes, donned my ad hoc armor, and grabbed my weekend backpack. The lot was still full of fun bikes and fun people. The CB450 fired right up and snarled for the group. Per procedure, I let her run on her own for about 60 seconds — long enough to let the timing chain noise quiet down and then disappear. All loaded up, I threaded my way through the crowd and headed out onto Prior Avenue. I opened the throttle wide and let the engine howl loud and proud. Another Third Thursday in the books, but my weekend of motorcycle adventures was far from over. The heat of the day had broken, and I was riding into a cool sunset. Just me and my little brown bike. Would Blue Cat consider relocating to Boston, Massachusetts? Seems unlikely. Are there no fun, egalitarian bike shops in your area?